The building housing the Sylvia Rivera Law Project at 147 W. 24th Street, which houses five of the city’s longest standing LGBTQ people of color and low income people-led organizations including the Audre Lorde Project, FIERCE, Queers for Economic Justice, Streetwise and Safe in addition to SRLP, was officially named the Miss Major-Jay Toole Building for Social Justice in a ceremony on Monday, August 26, 2013. The building was named in honor of Miss Major Griffin-Gracy and Jay Toole, two veterans of the 1969 Stonewall Rebellion. SRLP staff and collective member Reina Gossett (pictured below in center) spoke about Jay Toole at the naming event. Her remarks are below. I met Jay in June 2005 down in the village. 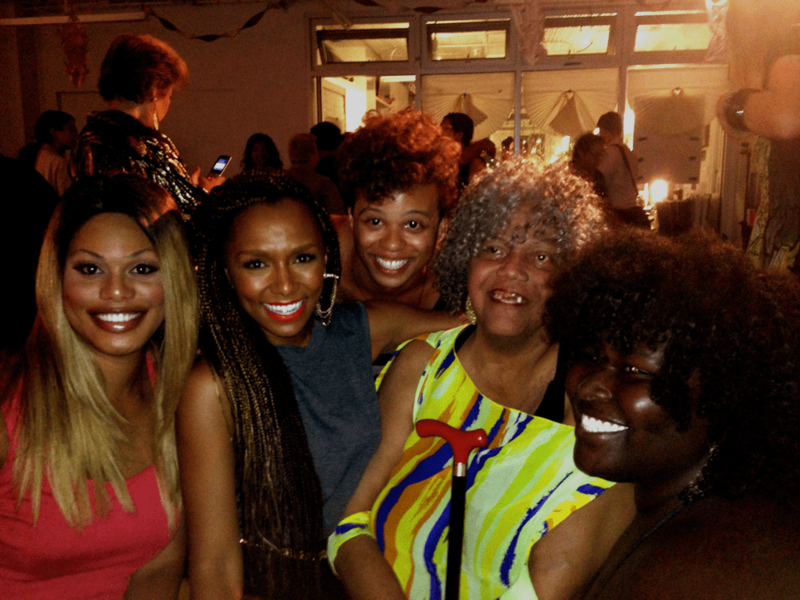 It was the day of the Audre Lorde Project’s first ever Trans Day of Action. Looking around this room I think I met a lot of you there too. That year, like every year hundreds and hundreds of trans and gender non conforming people of color filled the streets to let everyone know who we are, that we are not disposable, and in fact we are powerful enough to change the world. That next summer I started working with Queers For Economic Justice, an organization that Jay helped to found and is the longest serving staff member at. Every week, at least once a week Jay would go out to Bushwick, East New York, up to Washington Heights or the Bronx to visit city shelters that were pushed out of Manhattan as a statement about just how much this city cares about the homeless. Jay would visit these shelters for that very reason. As a way to build community power, Jay started support groups for people that most New Yorkers don’t think twice about: homeless lesbian, gay, bisexual, trans and gender non conforming people. On my birthday in 2006 Jay and I went to Bushwick to visit a shelter and try and start a shelter support group. For those us who have ever lived or visited a homeless shelter we know how demeaning this spaces can be, police and shelter guards going through your processions and talking to you in dehumanizing ways, and that’s on the better end of the scale. One this particular day as we went through metal detectors and told the security guard that we were there with QUEERS FOR ECONOMIC JUSTICE, the guard said nothing other than just laugh in our face. Jay’s sense of self in that moment inspired me to do the work I do and in the words of Marsha P Johnson “To Pay It No Mind.” Jay pushed me to know exactly who I am, who my people are and who i am definitely not here for. Living in a world where racism, transphobia, poverty, ableism, and homophobia dictate not only our communities ability to get jobs, get out of prison or detention centers, get into housing, or get on welfare its sometimes easy to forget that oppression can change the way someone feels about themselves. Transphobia can inspire shame, poverty can create self-hate, they certainly have for me. Jay awed and inspired me that afternoon when I witnessed her, someone who has had to navigate a life time of violence and fight constantly not just for her own survival but for the her friends, loved ones and community, know how valuable she was and let others know who she was here for. Because Jay has been here so much for us its perfect that today we now can be here to name our building and our movement in honor of Jay Toole. Right Now: Alisha Williams, SRLP Prisoner Justice Director On Huffpost Live!